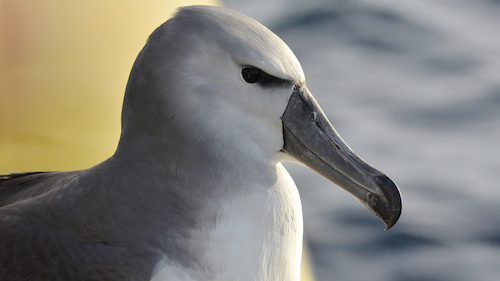 You may have heard in the news recently that a Shy Albatross was found a long way from home: in Poatina, up north. Thanks to a dedicated member of the public, the Animal Medical Centre in Launceston and our rescuers, we were able to transfer the albatross (nicknamed “Alby”) at our seabird rehabilitation centre in Brighton and give him the rest and rehabilitation he needed. A young albatross, Alby would have only been around 6 months old when he encountered his first storm, and we believe that’s how he got so off path. After a few days to regain his confidence, some good food and plenty of time in our seawater pool, Alby was ready for his release back to the wild with a little help from Pennicott Wilderness Journeys. We incorrectly said that Alby was found roadside in Poatina, however this is not the case. Ongoing gale force winds forced Alby into the Tamar River valley in northern Tasmania. He was found alive but tired on the shore some 40km from the open sea, and was rescued from this location. Unable to find a vet or wildlife clinic late in the afternoon, Alby accompanied his rescuer home to Poatina, in the Central Highlands of Tasmania, more than 80km inland. The next day he was delivered safely to the Animal Medical Centre in Launceston who passed Alby on to us at Bonorong Wildlife Sanctuary for rehabilitation and release. Newer PostBonorong makes the Ultimate Tasmania Bucket List! Older PostDo you dream of working with animals?